Amsleys’ Collision Services is family owned and operated by William (Bill), John, and C. Larry Amsley. Amsleys’ Collision was founded in 1968 when C. Larry Amsley decided he was not happy being an architect and pursued his passion which was cars. Even 45+ years later, we are still passionate about cars. We work on all types of cars and trucks, from a minor scratch to a major accident. We have repaired about 20,000 vehicles over the years. Thanks to Scantner Photography for this awesome drone tour. We pride ourselves in getting vehicles back on the road and looking great in a timely manner. We take great pride in being a family owned and operated business in Chambersburg. We have been at our current location on Wayne Avenue when we built a state of the art collision center in 1999. We strive to be professional and efficient. We work with ALL insurance companies and we are here for all of your collision needs. We will handle it all from frame straightening to a 4-wheel alignment and return your vehicle to manufacturers specifications. It all begins with the right people, right equipment and skills to make it all work. We have 7 full-time employees and 3 part-time. We have a combined 125+ years experience in the collision industry. 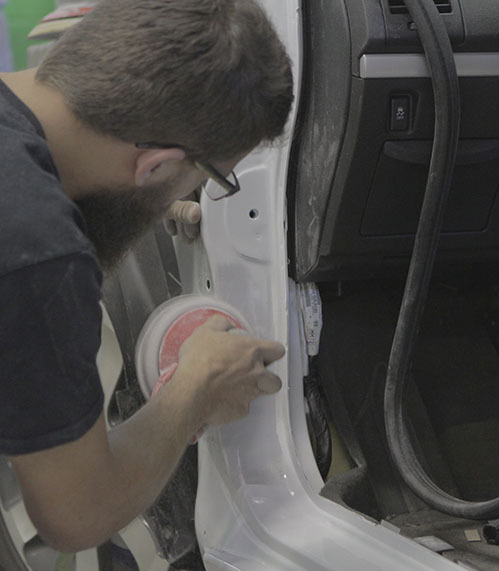 All of our skilled technicians are constantly upgrading their skills by attending certification classes on paint and collision repair procedures. Our trained technicians use the latest technology & equipment to repair your vehicle. Estimate Review: We will gladly review your estimate from the insurance company. Loaner Car Available: We offer a free loaner car while your vehicle is in our shop for repairs as long as you carry full coverage insurance on your policy. Fleet Work: We currently do work for several large Chambersburg businesses. We would love a chance to be your fleet collision center. Limited Lifetime Warranty as long as you own the vehicle. Spanish Interpreter available on site. Refinish your vehicle using a down draft paint booth with a baked on finish like the manufacturer. i have wrecked - what do i do? If your car is not drivable, then you can have your vehicle towed directly from the accident to our shop on Wayne Avenue. Contact the insurance company and follow their guidelines. Every company is different, but we work with ALL insurance companies. You are our customer not the insurance company and you have the right to choose your repair facility. Call us to schedule an estimate if the company tells you to obtain an estimate on your own. We will gladly schedule you an appointment for an estimate which generally takes about 15 minutes for a small job. It can take as long as 30 minutes to write a major collision estimate. Some insurance companies have their own adjusters which will write the estimate and then we will work off of that. We will email or fax your estimate so be sure to bring any contact info with you to your appointment. Get the insurance company approval of the estimate. Call us to schedule the repairs. We will have anything that is needed for your repair so that you are without your vehicle the minimum amount of time possible. We strive to get your vehicle back to you in a timely manner with very little downtime. We will then repair & refinish your vehicle to pre-crash condition using manufacturers specifications. Amsleys’ currently offers a limited number of storage units. We have 10×10 units and 10×20 units available. Our 10×10 rents for $50 monthly and our 10×20 rent for $75 monthy. We offer the option to pay your monthly rent via Paypal. Please have your Unit # available to use this feature. Please call us to check availability on our storage units. Call our office at 717.264.2500. We have a small revolving inventory of vehicles for sale at our 201 Wayne Avenue location. For more information call our Sales & Service number at 717-496-0324. Foggy headlights or mismatched headlights? We can help! Before Photo of 1 new and 1 old/existing headlight after a collision repair. The above image shows a car that was in for..